Glicks recently closed their outlet in Southland. Rents in major shopping centres are much higher than in strips and Glicks was not open on the busiest trading day of the week (but paying rent w.r.t. this day). Shows how pathetic banks are if one of NAB’s branches is not listed on their website. So NONE of the staff of Bentleigh branch have ever CHECKED the website to ensure the details are up-to-date? Carnegie also has a good mix of chains like Aldi, Woolies, Crust, Nandos, banks, real estate agents and independent stores/cafes centered around the station & rail line but for shops like Coles, Priceline, Target etc I much prefer to go to Bentleigh (with level crossing works and all!) rather than Chadstone given the mess that’s been there for traffic and pedestrians during the redevelopment that seems to be never ending. 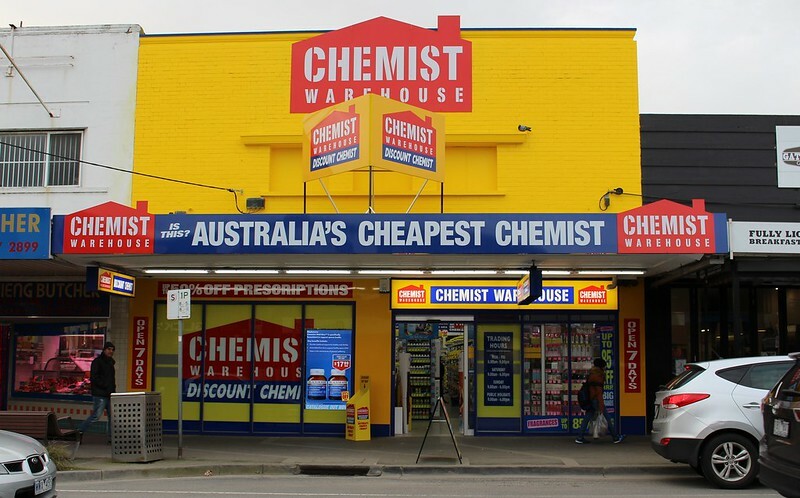 Weirdly though there’s two Chemist Warehouses within about 250m of each other on Koornang Rd, plus another random chemist in the same block so they must have all been there for a while. I totally agree with the local shopping sentiment though, they’re much nicer to spend time in than the big malls and I hope people continue to use them once the skyrail works start in that area as well. @Deb – I seem to recall the ‘random’ chemist having a sign saying they’ve been open since 19whatever – a fair few decades ago. It doesn’t seem to be doing too badly. I think Carnegie’s biggest advantage is (casual) dining, although it does also have large food retailers (and a couple of fruit and veg shops). It would be interesting to hear you explore why you like these strips more than the big shopping centres. The shopping centres are certainly more popular, they are climate controlled and they force more incidental exercise than parking replete shopping centres. Carnegie has two Discount Warehouse chemists close to each other. There are two Woolworths but the one on the highway is mainly empty since people chose to support the one in the town. The retail tenants of the Spotlight Centre do not seem to do too well, could not even support a $2 shop. Was strange that the corner of the Woolies converted to an Asian grocery but there is a proper Asian grocery in the centre now. Not sure how long Gami chicken will last since no places seem to last long opening there due to no parking and being close to the pub. Carnegie – yeah I can only imagine they opened the northern Woolworths to stop Coles entering the suburb. Or perhaps they hoped to close the southern one. Now they’re stuck with both… though maybe they’ll reconsider once the level crossings are gone and the railway line is no longer a barrier… the highway is likely to remain a (psychological at least) barrier for a while. 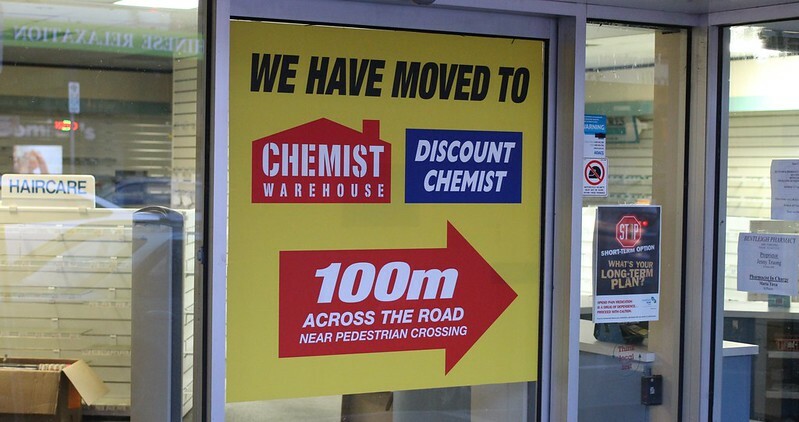 Perhaps a similar thing with Chemist Warehouse in Carnegie; one chemist transitions into the franchise, and another, not wanting to lose business to it, joins up as well. @Rod, thanks – I found the NAB web site quite difficult to navigate (at least as far as finding a list of branches), so I’m not surprised I messed it up and filtered by extended hours branches. @Jim, for me I think it’s just personal preference, in part because it’s so difficult to get to Southland and Chadstone, which almost always have parking difficulties, and poor PT links. That said, I’ll go there if I want something I can’t get elsewhere. Bentleigh wins points for me because it’s within walking distance from my house. Personally I prefer the local shopping strips because the Carnegie one is in walking distance from my apartment and there’s a couple of independent places in Bentleigh that I really like so I do other general shopping while I’m there as well. There’s been construction happening at Chadstone for well over a year now and the parking is messy, not to mention the traffic on Dandenong Rd at any time of day (either drivers don’t realise it’s 80km/h in that part or they come from other areas and don’t know the road at all) so it’s just a stress I’d rather avoid. I also work inside an office all day so climate controlled conditions are something I like to get away from at the weekend! The traders in the smaller shops also recognise me and it’s just a more community friendly atmosphere that you don’t get with the masses at the malls. As for supermarkets the southern Woolies in Carnegie always seems to be popular although the car park is also used for people visiting cafes & restaurants in Koornang Rd. It’s also a smaller store where they often seem to trial new products before putting them out in the bigger stores and again it’s within walking distance for me. The underground parking at the Spotlight Woolies is really hard to get in and out of, partly due to traffic build up at the level crossing and congestion with on street parked cars and I just find the whole building really unappealing, will be interesting to see what happens once a new station is built there though. The only problem with Chemist Warehouse(s) is that they are slowly eroding the pay of Pharmacist’s, such that I was paid more as a shift manager at a McDonalds than a pharmacist who literally has the lives of the community in their hands. Sad. But hey, cheap perfume amirite?!? !